Let Spin is a band of busy musicians working in a variety of contexts, in locations across Europe. When they work together as Let Spin they bring compositional ideas to the table formed from their collective performance experiences. Let Go is their second album. All of the material is informed by the input of all four band members. Bassist Ruth Goller wrote the opening track I Like to Sound Like a Rainforest on the day Charlie Haden died. Goller said: I have never written anything with such a strong flow. It is Goller’s simple folk-like line that begins the piece giving way to her and Panter’s high energy groove, Chris William’s powerful alto playing and guitarist Moss Freed feeding in a succession of considered chords. Williams’ Walt’s Waltz hears the composer’s alto writhing, straining against an insistent heavy bass and drums groove with guitarist Freed’s sound lost in the turbulence of it all. Goller’s All Animals are Beautiful affords Freed the opportunity to be heard, riding over Panter’s constantly shifting patterns before Williams’ sinuous alto takes it down and out. Disa, the first of Berlin-based Panter’s compositions, features searching alto guided by a snare and cymbals foundation. William’s own composition Killing Our Dreams, a down beat affair, ratchets up the tension, finally dissolving into stillness. Moss Freed’s E.V.A. (Extra Vehicular Activity, i.e. a space walk) begins quietly, viewing Planet Earth from a perspective which few humans have ever done. Then, if not in panic, the realisation that something could go wrong (see Ruth Goller’s CD cover art), invigorates the piece. Beats and Pieces’ Finlay Panter confesses that Rotation, the album’s penultimate track, is a tribute to all the rock that I love; an unusual time signature, the quartet enjoys a rock ‘n’ roll jazz blowout. Freed’s Rothko’s Field has the effect that the title may suggest it should have on the listener – standing in front of a Mark Rothko canvas invites contemplation. A welcome coda to all that has gone before. 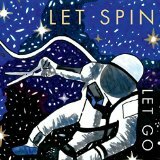 Let Go will be released on October 23 on Efpi Records (FR023). Let Spin’s British tour begins the following day at the Vortex, London, continuing to the Jazz Café, Newcastle 27, Edinburgh 28, Glasgow, 29, Lancaster (the Gregson Arts Centre), 30, and Zeffirelli’s, Ambleside, 30, before finishing up at the Fox and Newt, Leeds, on November 1.